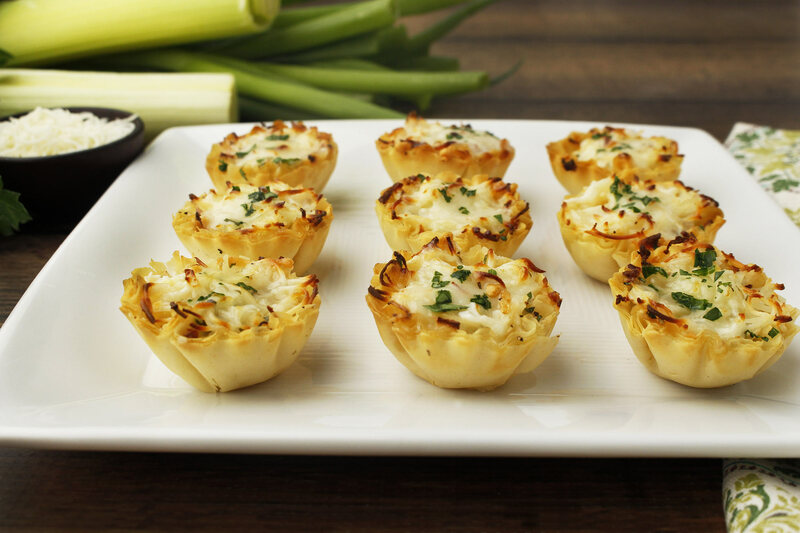 These mini tartlets are great for starting your holiday party. They're simple to make and your guests will love them. They have a delicate onion flavor and sweetness from the caramelization. The Gruyere gives them a nutty and salty taste, but feel free to swap it for your favorite cheese. Chop off the green top part of the leek and the root off the bottom. Now slice the leek lengthwise. Rinse in cold water to remove any soil. Slice and finely chop. In a large skillet, melt 1 tablespoon butter over medium heat. Add the onions and cook until the onions start to caramelize, about 5 to 10 minutes. Add in the leek, salt and pepper and sweat a few minutes more until the leeks are soft. Remove from heat. In a small bowl, combine the half & half, egg and grated cheeses. Add in the fresh thyme or parsley, then pour this mixture into the skillet with the leek and onion. Stir to combine. Lay a sheet of phyllo dough on a flat surface and brush on a thin layer of the melted butter to cover the whole sheet. Lay another sheet on top and continue this process until you have layered three sheets. Repeat this with the other three sheets in a separate stack. Cut each stack of phyllo into 12 square pieces each. Grease 2 mini tart/muffin tins with melted butter, then lay the buttered phyllo in each cup so that the phyllo creates a star shape and comes up the sides to make a nest. Spoon the mixture into each tart and bake in a 400 degree Fahrenheit oven for 30 to 35 minutes until the edges are nicely brown and the cheese has melted. Let cool slightly and transfer each tart to a plate. **Can be made ahead and cooked just before serving.